For over five years, we have had the privilege of being the exclusive jewelry designer for Mike Campbell's Rock the Dogs Foundation. Each piece is carefully handcrafted and then sold at auction to raise money for Rock the Dogs, an animal rescue organization in Mike's hometown of Burbank, CA. It's a win win for each person who makes a purchase. One cause supports animal rescue and the other supports mental health advocacy. Another bit of success was being featured on HGTV's Rate My Space show when it first aired launched back in 2008. It was a highlight of my life! My husband had gifted me a Recycled Lumber Pergola as my 2007 Mother's Day gift. We were so thrilled with the outcome, that we had to share photos. As a result, I posted pics on HGTV and was chosen by the homeowners (who were receiving the makeover in this episode) as one of their inspirations! Wow, what an honor that was! 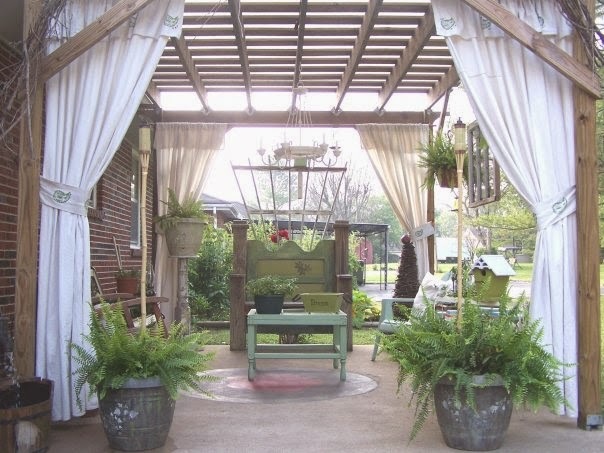 My humble pergola was simple and obviously very meaningful to me, but to know it inspired others was very exciting. So, here is the link and a sneak pic picture of how it looked a little bit after the show. I love everything about this. Almost everything was recycled. An old door and 6x6 posts became a cool bench that my friends named "The Throne". An old window and porch spindles became a coffee table. An old chandelier became a candelier and another old window lost the glass and we added screen with a stencil. A painted rug on the cement covered a big stain and there you have it. It was truly an oasis! Our personal story, Faith, Creativity and Managing Recovery, was featured on NAMI Faithnet website.